Delhi EVGC Guest Teacher Result 2017 - Delhi Guest Teacher Recruitment 2017 - Check Final Result Merit List Cut Off Marks - www.edudel.nic.in. 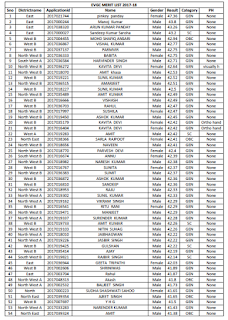 Today, the latest news is that Delhi Guest EVGC Result/Merit List 2017 has been released on official website in which a list of shortlisted candidates who will be called for station allotment has been issued. 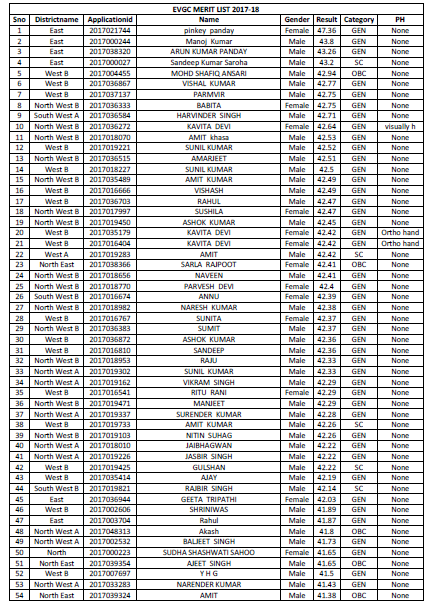 The merit list contains serial number, district name (East, West, North, South, North West A B, South West A B), application ID, Name of the candidate, Gender, Result, Category and PH. 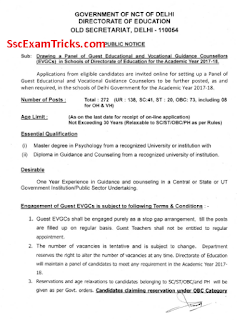 EDUDEL Delhi Guest Teacher Recruitment 2017-18 - Delhi EDUDEL Guest Teacher PRT/ TGT/PGT Guest Teacher 2016-17 - Delhi NDMC Guest Teacher Result 2017 - NDMC Application Forms Result Merit List Seat Allotment Joining Schedule - www.edudel.nic.in.